The average selling price rose 1 per cent last month from September to a seasonally adjusted $810,881, the first gain in three months. The benchmark price, which adjusts for the types of houses sold, rose 2.6 per cent from the same month last year. 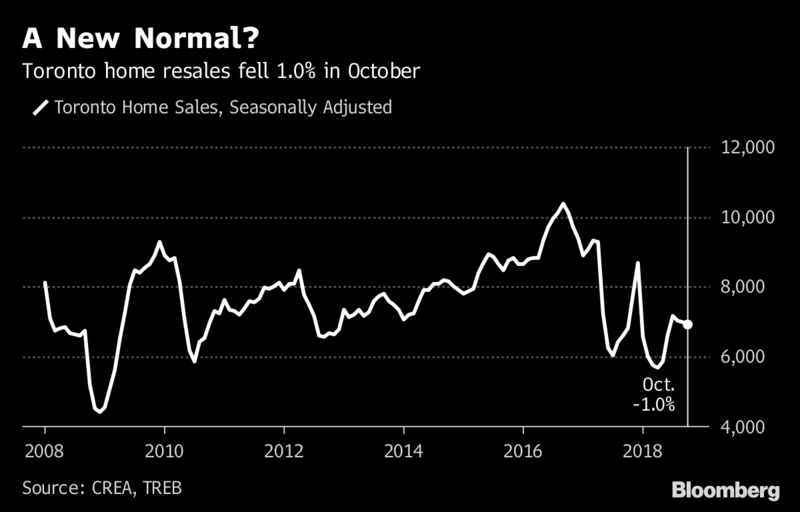 Sales declined by a seasonally adjusted 1 per cent on the month to 6,920 and were down 3.3 per cent from a year earlier, the Toronto Real Estate Board reported Monday. There is some evidence that the market could tighten as a lack of supply remains a problem while demand is strong, the real estate group said. The number of new listings fell 2.7 per cent in October from a year ago. On the economic front, Ontario’s unemployment rate was 5.6 per cent last month, about a percentage point away from a record low. “A strong regional economy and steady population growth will continue to support the demand for housing ownership as we move into 2019,” Bhaura said. The report showed price gains are being led by condo apartments over detached homes. Average condo prices rose 7.5 per cent in October from a year earlier, while detached home prices increased just 1 per cent. Semi-detached homes rose 6.6 per cent. The average condo price of $562,523 is about half the price of a detached home, at $1.02 million.